You’ve probably seen some of their goods in your grocers freezer. I know I have. They have quite a great selection of gluten-free frozen goodies that I have yet to try yet…although I have actually had one of their products. Back in October 2011, just as I was starting to get the hang of this gluten-free stuff…I bought a box of 4 of their Gluten-Free Yellow Cupcakes with Vanilla Frosting. I was lukewarm on the review…being that I dislike frosting and that it had been frozen prior to consumption. Of course, I had forgotten all of that up until a moment ago when I began this blog. Here’s how we wound up here. I was gearing up for a trip to Minnesota and Cathy, the infamous roomie, had said she really wanted to go back to The Bad Waitress to eat while we were there. However, as she was scouting through recent reviews, it turns out The Bad Waitress had been cited for health concerns…so we nixed that immediately. This meant searching a little bit for somewhere new to eat. Enter the savior of the moment, my aunt Jan, who had been messaging me back and forth on Facebook leading up to my trip. She said some colleagues at the hospital (she’s a surgical nurse) she works in mentioned a great place called French Meadow Bakery & Cafe. She must have been talking about my impending visit and the fact that I am a gluten-free vegetarian, because they mentioned to her the plethora of gluten-free options available…not to mention the gobs of vegetarian offerings. She mentioned this in the message. I looked it up. I sent the link to Cathy. We approved. And Jan said we would definitely go there one day while I was in town. That day just happened to be Monday. Jan had the day off from work. The cold weather had given way to a beautiful, sunny 78 degree day. And we were out and about in Minneapolis, doing a bit of shopping and whatever else we felt like. Our only plan…be outside and soak up the sun and gorgeous weather. With that agenda in mind, we did a lot of our indoor stuff (like hitting bookstores and the like) that morning. 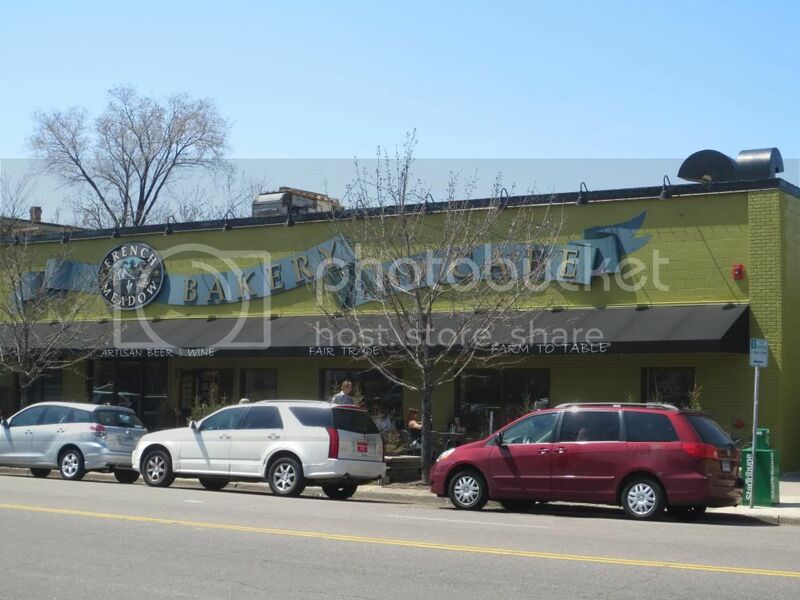 And when lunchtime rolled around, we headed into Minneapolis and down to Lyndale Avenue South, hoping to grab a bite to eat at the French Meadow Bakery & Cafe. We arrived, parking around the corner on the street to the brilliant yellow building. A short walk later and we were entering the premises…greeted by towering black boards that held the menu, written in chalk. It was fantastic and…overwhelming…but awesome. We gawked for a long moment at the boards, figuring out what we wanted to eat for lunch. Although there are still breakfast items as well…including a gluten-free waffle which was…SO tempting. We got it sorted just in time, because we were up next to order. Jan went first, ordering the California Wrap with a side of the Mixed Greens ($9.50). Cathy went for the Incredible Grilled Cheese Sandwich with a side of the Chips and Salsa ($7.50). Actually, I was expecting her to be a bit more adventurous than that when we ate here. That’s so…typical. 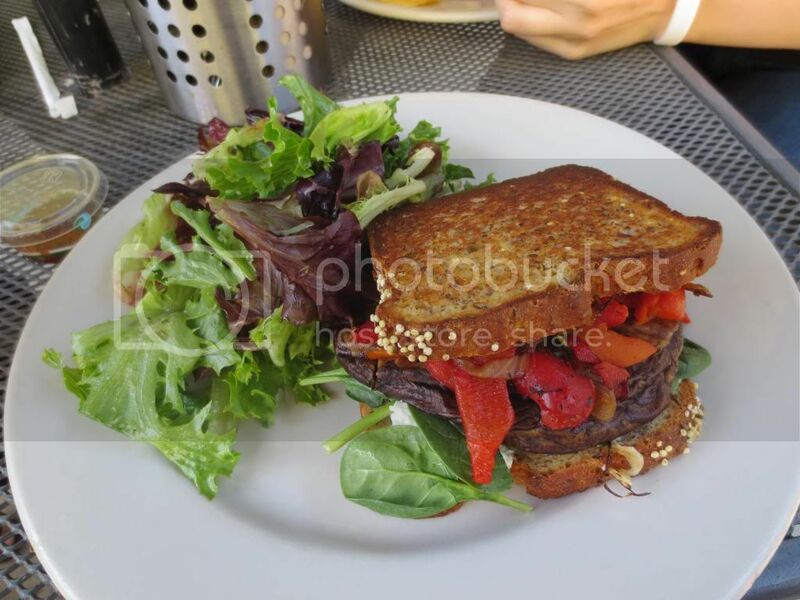 As for me, I opted for the Roasted Vegetable Sandwich on Gluten-Free Multigrain Bread with a side of the Mixed Greens ($9.00). I was given the option, I feel I should mention, of either gluten-free white, multigrain, or cinnamon raisin bread. I HAD A CHOICE!! That made me so stupidly happy. We were given our table placard, a big card of Edith Piaf, and we went to seek out some dining outside on the side patio. We spotted a table in the sun, but this made Cathy frown. So while Cathy and I made a run to the bathroom, Jan shifted us to a table with an umbrella and put Cathy out of the sunlight. She and I were shaded but still able to soak in the vitamin D. A happy medium. We were able to sit around and talk while waiting on food. While I had been inside, I snagged a little chipotle hot sauce to add to my sandwich. I mean…we all know I like thing spicy…and with my race run…I could now spice things up as much as I liked or dared. WOOT! A few moments later and our plates were being delivered. Everything looked fantastic. All of our sandwiches were loaded with ingredients (all fresh and organic, mind you!) and busting at the crusts. I eagerly snapped a picture of my Roasted Vegetable Sandwich with my mixed greens, then sliced that sandwich in half, added some hot sauce and took a bite. The Roasted Vegetable Sandwich is just what it sounds like. Roasted vegetables. But what all do you get? Let me fill you in. This sandwich is packed full of goodness. Starting with beautifully roasted portabella mushrooms, roasted garlic, roasted red peppers, caramelized onions, organic spinach, and then topped off with some chevre goat cheese. Oh yeah…it smelled divine. But even better was the taste. This has got to be one of the best sandwiches I have ever eaten. Honestly. The roasted vegetables only elevate the flavor, and the portabella mushrooms were done to perfection. They weren’t soggy and wet and making my bread to sponge up the fluid and fall apart. On the contrary, all of these vegetables meshed so well with the caramelized onion and the strong flavor of (my favorite) goat cheese. I was in sandwich heaven. And it took every bit of willpower in me not to just devour it on contact. I savored. I even ate the salad of mixed greens, which were lightly dressed in some sort of vinaigrette. Very tasty and the perfect accent to my sandwich, honestly. This was certainly one of my favorite places in Minneapolis that I have eaten so far. The food was awesome. All of us were so happy with our orders and ate what we wanted. If we hadn’t been so stuffed, I probably would have opted for one of their gluten-free dessert options. Maybe next time. What am I saying? DEFINITELY next time. With lunch polished off, the three of us continued our day out by taking the light rail down to Nicolette Mall and walking some of our food off. The flavor of that sandwich still resonates with me. I hope to get back to French Meadow Bakery & Cafe the next time I hit up the Twin Cities. It is certainly worth the visit and the trip. The food and service is out of this world. And you can tell they do take great pride in their variety and numerous options for different dietary needs. I know that I totally appreciate it. Dear French Meadow Bakery…I LOVE YOU. I promise to come back soon. Promise! This entry was posted in Baked Goods, Bread, Breakfast, Cheese, Cupcakes, Dressing, Entree, Food, Gluten-Free, Mushrooms, Restaurants, Review, Salad, Sandwich, Vegetables, Vegetarian by The Celiathlete. Bookmark the permalink.